Pioneers in the industry, we offer auto soft loop handle making machine from India. We offer Auto Soft Loop Handle Making Machine. 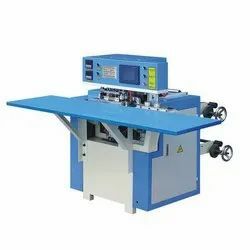 The meter counter can set printing quantity according to the requirements Stop the machine automatically at the set quantity or when the material is cut off. Lift and lower the printing plate cylinder manually, it will automatically stir the printing ink after lifting. The printing ink is spread by the knurled cylinder with even ink color. Reliable drying system coordinated with high-speed rotation, it will automatically break circuit when the machine stops. 360 continuous and adjustable register device. This machine is suitable for printing such packing materials as polyethylene, polypropylene plastic bag, cellophane and roll paper, etc. And it is a kind of Two color ideal printing equipment for producing paper packing bag.